LAS VEGAS — In the dim light of her tidy trailer, the widow dabs at her eyes and presents proof that the man she loved for more than four decades — “my Wally” — existed. Proof that he was born, worked, sacrificed, lived and died. An ordinary man, but one like no other. His name was Walter S. Kasza, and Stella Kasza wants you to know that, damn it, he existed. He was her man. She displays his Army papers: He landed in Europe in ‘44, fought in the Ardennes, earned three bronze stars. On the paneled wall hangs their wedding portrait — St. Norbert’s Church in Detroit, 1950 — and pictures of their children. “You’re together that long, you eat together, you sleep together,” Stella says, her voice dissipating to a sigh. More tears, another tissue. From the pantry she retrieves a brown paper bag full of empty pill vials. For years the doctors couldn’t figure out why Wally was coughing so much, why his skin cracked and bled, turning their bedsheets red. They prescribed unguents, antibiotics, decongestants, pain killers. His guts ached for years, too, and when they finally found the kidney cancer, even morphine didn’t help the pain. He died in April 1995, a wraith, 73 years old. Stella Kasza, silver-haired, strong-willed — “I’ve got a temper, a Polish temper,” she warns — blames all the high and mighty officials back in Washington for what happened to her Wally, and one big shot in particular. “If Clinton was here right now I’d look at him and say, You know what you did to my man? You took my life away. You — ‘ “ She spits out several curses. Bill Clinton certainly did not kill Wally Kasza, but he has been forced to deal with his angry widow. The administration maintains an abiding interest in the lawsuit Stella Kasza has brought against the federal government. Under a “presidential determination” that he must renew annually, Clinton has decreed that potential evidence related to Kasza’s death is classified, top-secret, a matter of national security — and that “it is in the paramount interest of the United States” that none of it be disclosed. Why should Wally Kasza matter? He was a sheet-metal worker. For seven years he put up buildings and installed cooling systems for a defense contractor at an Air Force base in the middle of the Nevada desert. But that base, about 100 miles due north of here, is the most mysterious in America. It is so secret that top officials won’t say anything about it — they claim it has no name. They only speak of it in the most general terms: “There is an operating location near Groom Dry Lake.” That’s the Air Force’s official position. Stella Kasza and the rest of America know it as Area 51. In the imagination of UFO enthusiasts, Area 51 is where the government harbors space aliens and conducts experiments on recovered interstellar craft. The real secrets of Area 51 are more mundane. And they involve things more dangerous to human beings than the squidlike aliens in “Independence Day,” a movie that used Area 51’s obsessive secrecy as a plot device. What’s being covered up there, according to lawsuits filed by Kasza’s widow, another worker’s widow and five former Area 51 employees, are brazen environmental crimes. For several years, the workers say, they labored in thick, choking clouds of poisonous smoke as hazardous wastes were burned in huge open trenches on the base. Military officers armed with M-16s stood guard as truckloads of resins, paints and solvents — materials used to make the Stealth bomber and other classified aircraft — were doused with jet fuel and set ablaze with road flares. Another sheet-metal worker at Area 51, Robert Frost, died at age 57, allegedly from exposure to hazardous wastes. Biopsies showed that his tissues were filled with industrial toxins rarely seen in humans. Men who worked there from the late 1970s into the early 1990s say that inhaling the smoke resulted in persistent respiratory distress, cancers and strange rashes. “Fish scales,” the workers call these hard membranes. Some use sandpaper to remove the embarrassing growths from their hands, feet, legs and arms, but they keep coming back. They slather themselves with Crisco to stop their skin from blistering and cracking. What is the government’s response to these horror stories? The government says . . . nothing. The policy is that nothing illegal occurred at Area 51 because, officially, nothing occurs at Area 51. Employees there cannot talk about the work they do. Everything and everyone connected to the base is classified — part of the military’s multi-billion-dollar “black budget” operations. “Specific activities . . . both past and present . . . cannot be discussed,” the Air Force says in a statement. That position infuriates Stella Kasza because it makes her husband disposable, a nonentity. 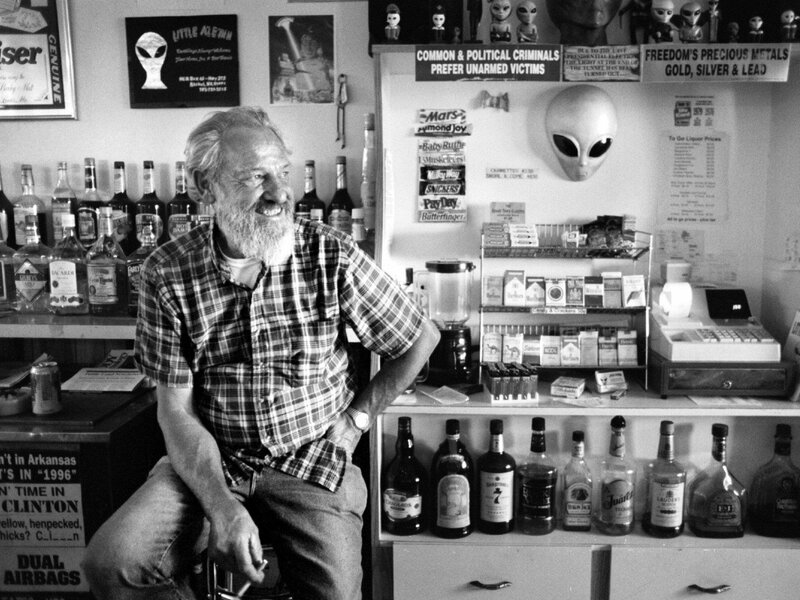 She sees it this way: If, officially, Wally Kasza didn’t work at Area 51 for seven years, then, officially, his death had nothing to do with his job. He didn’t wake up with bloody pajamas from the fish scales, didn’t hack his lungs out in the middle of the night kneeling next to the bed. Didn’t get cancer. Didn’t suffer so horribly that his son wanted to smother him with a pillow to end it all. Turley is a law professor at George Washington University — he directs its nonprofit Environmental Law Advocacy Center, funded in part by Hollywood do-gooder Barbra Streisand. He flies here every few months to meet with the clients he is representing in a lawsuit against the government — Area 51 workers past and present and their families. He represented Wally Kasza before he died. The brash young lawyer would meet the sick old man in secret, in cars and garages, fearful of detection by military investigators. If Turley seems paranoid — he avoids using hotel phones, travels under phony names, swears he is being tailed — he has his reasons. The Area 51 workers he represents also face 10 years in the slammer if they are caught disclosing anything about their jobs. In court papers, they are identified only as John Doe. Their affidavits express fear of “retaliation, harassment and injury” if their civilian employers or the military finds out who they are. Turley represents more than 25 workers at no charge. He filed the case three years ago against the Environmental Protection Agency and the Department of Defense. The plaintiffs aren’t asking for money; they want information on the chemicals they might have been exposed to so they can get appropriate medical treatment. They also want the military to admit that burning barrels of toxic wastes — allegedly twice a week for more than a decade — was wrong. And they want an apology. “Let them admit the truth,” one worker says. They’ll probably get none of the above. So far, the government’s arguments for absolute secrecy have largely been upheld in U.S. District Court here. Unless they win on appeal, the Area 51 workers will face the same fate as the nuclear test site workers, uranium miners and the hapless citizens of Nevada and Utah who were exposed to radiation during the heyday of atomic bomb testing: Many got sick and died, and the courts held no one liable. Turley had hoped that, when confronted with credible testimony about environmental crimes and evidence of the workers’ illnesses, the Pentagon might cover their medical bills, or allow them to be treated for free by military doctors with the proper security clearances. He asked the Justice Department to give his clients immunity and launch a criminal investigation. Instead, the Justice Department, the EPA, the Air Force and the White House erected a stony wall of secrecy — not denying the charges, but not confirming them, either. A few months after Turley sued, EPA officials conducted their first-ever inspection of Area 51. It was a victory, but a hollow one. Backed by Clinton, the Air Force refuses to disclose the results of the inspection — meaning the workers can’t know what hazardous wastes might have been incinerated there. “President Clinton’s decision protects the environment and national security,” the Justice Department intones. In a statement issued to The Washington Post, the Air Force touts its “strong environmental record,” but spokesmen refuse to address any questions about Area 51. “Most people understand that there is some information the government has to keep secret . . . to protect national security and the military personnel who keep us all safe,” the statement says. The litigation puts the government in the Orwellian position of trying to keep secret a 40,000-acre complex where airplanes and buses full of workers arrive every day. (Hundreds of them commute from Las Vegas’s main airport on 737 jets that bear no external identification numbers.) Not only have Russian satellites photographed the base — huge blowups are for sale locally — but it can be observed from a nearby mountain. Locals also call it Dreamland, Watertown, the Ranch, or more generically, the Test Site — a name that dates from the ‘50s, when you could sip “atomic cocktails” in Vegas while watching mushroom clouds rise over the desert. The weathered metal sign at the border of Area 51 identifies it in large red letters as a “Restricted Area.” It warns that anyone who trespasses comes under the jurisdiction of military law. You may be buzzed by a helicopter or an F-16. You may be shot. In many ways this place is an anachronism, a vestige of the days when unquestioned military authority seemed necessary to keep the world free. At Area 51, a rigid Cold War mentality still prevails: America’s enemies are everywhere. Workers tell of an intimidating security apparatus within the base, of wiretaps and gunpoint interrogations. Established by the CIA in the mid-’50s, the base sprawls over a dry lake bed that once served as a landing strip for the U2 spy plane. The reasons for calling it Area 51 are obscure, but declassified manuals cite an equally mysterious Area 27 and Area 12 in the vast federally owned desert. Solar-powered robotic video cameras observe anyone who approaches Area 51’s perimeter; parabolic microphones pick up conversations. There are motion sensors beneath the dusty soil. “They’re watching you now,” Jonathan Turley says, hiking up a ridge about 13 miles from Area 51. He focuses his binoculars on the spindly robot, and scans the ridge for evidence of Jeep-driving security men, known locally as “Cammo Dudes.” None is visible. “They’re being shy today,” he says. Trying to prove a point, Turley has brought us to the base’s one public border that can be reached by paved road. When a white-and-silver bus barrels by in a cloud of dust, he is ecstatic. “Did you get a photo? !” he shouts. Typically, those bus riders would be union laborers — the Wally Kaszas of Area 51 — who rise at 3 a.m. for the haul up from Vegas. The bus is evidence that people work at Area 51, of course. But Turley also regularly photographs the buses and planes to document what he calls “activity consistent with hazardous waste storage.” If there are vehicles, there must be batteries and fuel on the base, he argues. The Air Force refused to admit even that much in its legal briefs. The government’s lawyers say that acknowledging the existence of innocuous and essential items would place the nation at grave risk. The “mosaic theory,” the Air Force calls it. If, say, the Iraqis or North Koreans were to learn about any materials or chemicals used at the Groom Lake base, the argument goes, they could puzzle out how we make secret weapons and radar-defeating planes. The workers say that under the mosaic theory, nothing could leave the base, and that’s why everything was burned, from old computers to entire tractor-trailers. Some men had to scramble into the pits after the ashes cooled to ensure complete incineration — increasing their exposure to toxins, according to the lawsuits. Environmental crimes are particularly insidious because, as Turley points out, the victims often don’t know they are victims. The burnings alleged by the workers are punishable by up to 15 years in prison. From their perspective, the evidence has been suppressed by the most powerful man in America. Federal environmental law requires public disclosure of the results of the EPA’s inspection of the Groom Lake base. To prevent this, President Clinton invoked the military and state secrets privilege, specifically exempting the base from disclosing any pollution reports. Prone to hyperbole and something of a media hound, Turley is the grandson of a former United Mine Workers official who contracted black lung. He likes to quote his grandmother’s recollections of how mules were deemed more valuable than people by the coal companies. Now 36, Turley has been a loyal liberal since his days as a teenage congressional page. He takes on cases that give him high-profile platforms — he also represents rebellious federal grand jurors who investigated environmental crimes at the Rocky Flats nuclear weapons facility in Colorado and opposed the Justice Department’s decision to levy fines rather than send corporate officials to jail. Turley sees delicious hypocrisies in the Area 51 case. It allows him to target a president who’s often touted his environmental record. And who claims to have empathy for working-class citizens done wrong by government experiments. In October 1995, Clinton publicly apologized to victims of secret radiation tests in New Mexico. Sitting in a seedy motel room near the Vegas Strip, his back to the window, the man offers a handshake and introduces himself. “John Doe,” he says in a phlegmy voice. He proceeds with his story of how 55-gallon drums of classified chemicals were trucked in from a California aircraft facility and routinely set ablaze at Area 51. “The barrels would blow up and vaporize, like a huge smoke grenade. The smoke was dark, grayish white — it was as thick as London fog.” He hacks, wheezes and clears his throat. As a condition of conducting the interview, Turley says we can’t describe the man or his work in any way. The lawyer believes the Air Force’s Office of Special Investigations (OSI) is trying to photograph or otherwise hunt down the “John Does,” to bring charges against them for breaching national security. Turley paces nervously, drawing aside the curtains on the room’s only window, checking the peephole at the door. He turns up the television — a precaution, he says, against electronic eavesdropping. “I’m sure the room’s clean but that window bothers me,” he says. Laser microphones can pick up conversations from vibrations on glass, even from the ice in a drink. Turley keeps up on spook technology. He once did a stint in the general counsel’s office of the National Security Agency. He instructs John Doe to take a seat farther from the window. The man goes on: How workers were denied breathing masks; how he was told to quit if he didn’t like it. But the money was good — at least $15,000 above the annual wages in Vegas. You just had to get used to a climate of fear. If you were ordered not to look up at some crazy new plane overhead, you kept your eyes on the dirt. The van’s passengers have put its hood up. To Turley that’s a classic sign of surveillance: the old car-trouble ruse. The lawyer picked this motel because guests must park in a central courtyard. The room’s window faces a rarely used road. What is that van doing there? A reporter and photographer drive around the side of the building to case the van. The men are gone. It’s a dark blue Dodge, a bit beat up. Its license plate reads . . . It was all a coincidence, an Air Force spokesman at the Pentagon says later. Yes, the Office of Special Investigations routinely probes national security leaks, but that wasn’t an OSI detachment, he assures us. The Air Force traced the license number of the blue van. It turns out that the men came from a C-141 transport plane and were overnighting in Las Vegas because of a bunk shortage at nearby Nellis Air Force Base. Can we have the van’s maintenance records, to see if it really had a breakdown? He may be next. Ugly, crusty scales cover part of his body. All of this started because of $300. About 10 years ago, Robert Frost, who was foreman of the sheet-metal workers at Area 51, became so ill that he missed a week of work. By then his face and body were scarred by scales and red welts. He would drape himself in a blanket to shield his skin from the sun. His legs buckled when he tried to walk. Frost filed a claim for lost wages; his employer, Reynolds Electrical & Engineering Co., fought it. By the time a hearing was held in 1990, Frost was dead of a liver disease that doctors associated with exposure to smoke containing dioxin and dibenzofurans, chemicals found in plastics and solvents. But the compensation claim was denied after a company superintendent testified that no burning ever occurred at Area 51. Furious, she wanted to file a wrongful death claim, but the lawyers in Las Vegas told her there was nothing to be done — the military and its contractors were too powerful. Eventually Helen Frost found a Washington watchdog group, the Project on Government Oversight, that was willing to investigate. She knew of several other widows and workers. One of them was her husband’s good friend Wally Kasza — a guy so tough he worked up at Area 51 until he was 69, when he became too sick to go on. Wally and “Frostie,” as friends knew him, were union brothers in Local 88. Now their widows are united in their scorn for the federal government, lending their names to the lawsuits Frost v. Perry (against the former secretary of defense) and Kasza v. Browner (against the EPA administrator). Turley, who took over the case from the oversight group, is like a son to them. When he comes to call, they have cookies and pies waiting, and the latest proud stories about their grandchildren. They are a lot alike, Stella and Helen. They grew up in ethnic Rust Belt towns, met and married their men as teenagers — they never thought they’d lose them. Their men had fought wars, come home to tell about it. How could the government they fought for betray them, put them in mortal danger without fair warning? How could everyone right up to the president deny it? Keeping secrets is one thing, the black-budget widows say. But people still ought to count for something. The truth ought to count. Stella Kasza points to the wall. An Olan Mills studio portrait taken several years ago captures her loving gaze as she poses next to a still-handsome old devil with wavy gray hair, the guy whose big grin and blue eyes first made her swoon when she was 15, when he lived down the block. A sappy country song is playing on the radio. Stella turns it up, up, up — as loud as she can stand it. Something about having one last night together on the town. She sways across the room, alone, trying not to cry again. CAPTION: It’s out there: Attorney Jonathan Turley squints into the sun toward Area 51, 13 miles away. That’s about as close as you can get without security clearance. Turley represents more than 25 workers who claim that they were injured there. The government contends there is no “there” there. CAPTION: Stella Kasza, left, with her son, and Helen Frost, with her daughter. Both women are widows of men who became sick after working for years at Area 51. Frost displays photos of her husband. “Nobody gives a damn,” says Kasza. “Nobody.” CAPTION: Unmarked buses and planes haul union laborers, like Wally Kasza, below, and Robert Frost, from Las Vegas to Area 51. Right, Jonathan Turley and co-counsel Joan Manley at their office at George Washington University. The warning posted on their door is a federal court order — students and others are not allowed to enter because the government says Turley’s files hold documents that are classified.